According to the English dictionary, â€œballastâ€ means something that gives stability. Thus when referring to an electrical ballast, we mean an electrical device that plays an important role in maintaining the stability of the electrical circuit. However, the question you may have is how does it provide the stability? Some electric ballasts limit current while some limit voltage, depending upon the circuit in which they are used. By doing so, they reduce the risk of either over voltage or over current in the circuit and thereby enhancing the stability of the system. Electric ballast varies greatly in complexity. It can be as simple as a resistor, capacitor, inductor, combination of these or it can be as complex as the electronic ballast used in the florescent lamp. Here in this article, we shall discuss about simple electric ballast, the ballast resistor. A ballast resistor is used in a circuit to limit the current and hence prevent it from over current faults. Here, as the current in the circuit varies and increases above a particular threshold value, the resistance also starts to increase. This in turn decreases the current and protects the circuit from over current faults. Thus, maintaining the stability of the circuit. These devices are mostly connected in parallel with the load of the circuit. Now let us discuss some of its areas of application. As we know, fluorescent lighting is one of the popular and efficient lighting system. However, there is downside to this type of lighting system. It gets heated very fast when directly connected to the voltage source. This happens due to the uncontrollable current draw by the lamp, as soon as it is switched on. In order to avoid the overheating due to the excessive current draw, a ballast resistor is used in the circuit, by connecting it in series with the lamp. So what does a ballast resistor do? It simply regulates the current and reduces the voltage. However, for the lamp to light up, it needs to establish an arc between its two electrodes. For this, a high starting voltage almost equal to the supply voltage is needed. 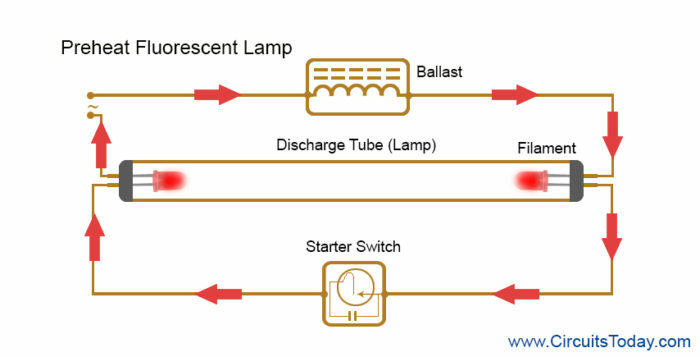 The ballast resistor, supplies the needed voltage during the start up, and then immediately after the arc is established, it reduces the voltage in addition to regulating the current flow. The figure below shows a florescent light tube connected with a ballast resistor and a starting switch. The ballast resistors are often included in the ignition kit of automotive machines such as car engines. Due to its application, such devices are called Ignition Ballast Resistor. Use of this device reduces the risk of coil failure. It is installed in the circuit between the primary voltage source for the ignition coil and the coil stud. This helps to reduce the coil voltage and coil current, therefore with the addition of the same, the coil does not get as heated as it would without the same, thus increasing the life of the coil. However, during the starting of the ignition engine, a high voltage equal to the primary voltage source is needed. Therefore a jumper wire is often connected with the ballast resistor. This jumper wire provides the necessary voltage to make the engine start. 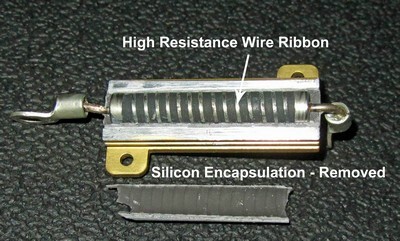 The figure below shows a ballast resistor used for automotive applications. In an LED circuit, if the source voltage is greater than the rated voltage of a LED lamp, then it may damage the LED. Thus to avoid the same, connecting a ballast resistor in series with the lamp is highly recommended. Connecting the ballast resistor in this way reduces the voltage across the LED to its tolerable value. The figure below shows the circuit diagram of the same. IF =Forward current of the LED. So if you have an LED with a voltage rating of say 4 Volt, forward current of say 10mA and a voltage source of 6V. ThisÂ means that the voltage across the LED should be either 4 or less than 4. Therefore, the resistance of the ballast resistor should be either R= (6-4)/0.010 = 200Î© or greater than that. Now that we have discussed briefly about the applications, let us discuss the types of Ballast Resistors available. Like any resistors, these resistors are divided in two groups namely fixed resistors and Self- variable resistors. These type of ballast resistors have a fixed resistance. Mostly a high resistance value is preferred for various applications. This type of ballast resistor is used mostly in simple circuits that have low powered loads like neon or LED lamp. 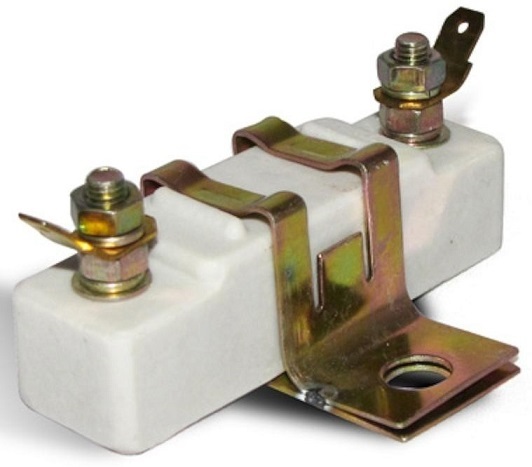 This fixed resistor also finds its use in the adjustment of the ventilation fan speed. A fixed ballast resistor with two centre taps is used. The fan speed selector switch bypasses the portions of the ballast such that for full speed, whole portion is selectedÂ and for the low speed, no portion of the ballast resistor is selected. The advantages of using this type of ballast resistors is that it gives a more precise current control than an appropriate fixed resistor. Another advantage is that the power lost in the resistive ballast gets reduced as a smaller portion of the overall power is dropped in the ballast compared to a fixed resistor. This brings us to the conclusion of the article. Lets revise all that we have discussed above in a nutshell. 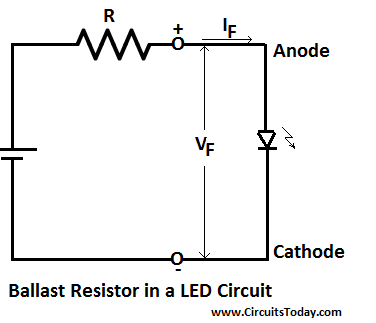 â€œBallastâ€ is something that gives stability and hence a resistor used for over current or over voltage protection in circuit that in turn gives stability to the circuit is referred to as ballast resistor. 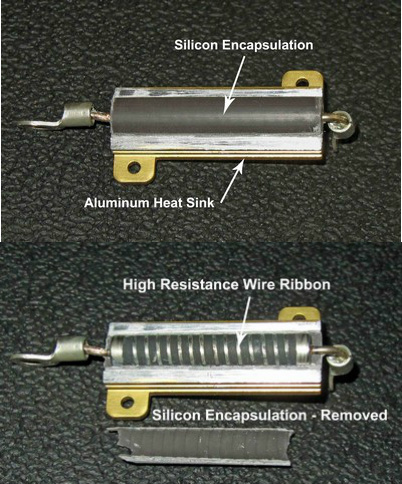 These ballast resistors have major applications in areas of automotive and in lamp circuits. Nowadays car engines have a ballast resistor kit, along with the ignition kit, to protect the coils. Other application in the automotive area is the regulation of speed of a ventilation fan. In lamp circuits, these resistors are often used in series or in parallel to the lamp load. The two types of ballast resistor are fixed and self varying ballast resistor. True to their names, they work in the same manner. The fixed ballast resistor has a fixed value of resistance and often a high value of resistance is chosen. These resistors find application in low power loads like lamps. The resistance of the self varying ballast resistors, on the other hand changes with respect to the current; the resistance increases as the current through it increases and decreases accordingly. Nice and useful article. Comfortable language. Keep going..